Reduce clutter in your menubar by having a multi-clip copy paste utility, a text expansion tool, notes, reminders and scripting all in one place and working together to increase your productivity. Do less and accomplish more. Download free and try it out. Text Expansion – instantly type repetitive text like your name, address or resume with a shortcut of a few characters. Multiple Clipboards – based on the original multiple clip app CopyPaste. Notes – a handy place to keep your notes. Scripting – scripts that provide small but powerful abilities from the menubar. Download and install it then you can learn it’s features as needed. The 2 main features are text expansion and multi-clip tool and those are very easy to use and instantly useful for everyone. Text Expansion amplifies your typing ability. Type a few characters (shortcut) to paste a much larger block of text (expansion) like your name, a url, picture or even several pages of formatted text instantly anywhere on your Mac in any application. Do you get tired typing the same url, address or response letter all the time? Save hours of time, typing hundreds of characters and the strain on your hands, eyes and brain of doing the same thing over and over. This is what computers are for. Use yType and type a few letters and a space to pop into any document a word, a sentence, a page, 20 pages or even more instantly. Use yType to ‘do less and accomplish more’. Another way that yType can save time is in typing symbols and other difficult to find unicode characters. 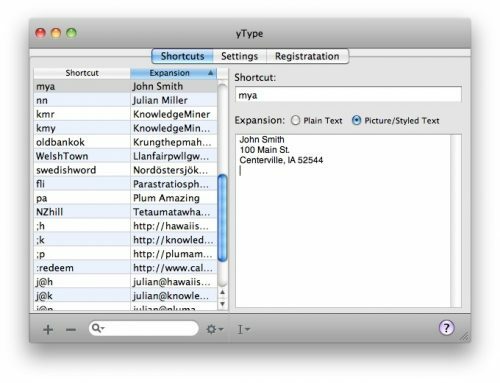 Make up your own unique shortcut names like like vheart for ? , etc. for unicode characters you might find useful like vcent for ¢, veuro for €, cp for ©, reg for ®, tm for ™, etc… yType makes all symbols much easier to use. Do you have Hippopotomonstrosesquipedaliophobia? That is the fear of long words. Seriously, it is a thing. yType is the cure for this dreaded disease which afflicts children like the Hawaiian boy (a real person) whose name is Kananinoheaokuuhomeopuukaimanaalohilo. yType would allow him to type just ‘ka’ and a space or return to expand his whole name instantly saving him thousands of hours he might otherwise spend during his lifetime just typing his own name. Here is another Hawaiian who could benefit from using yType for her name. ✓ create a shortcut (a few letters) to enter large blocks of text or pictures and formatted text in any mac application. ✓ copy and paste or drag in the blocks of text, pictures or formatted text. 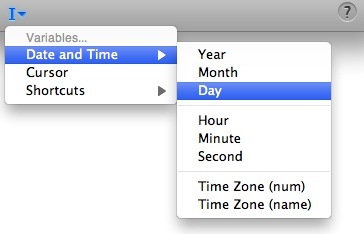 ✓ use variables to insert the month, day, year, time, cursor, timezone. ✓ embed one variable within another. ✓ search thru all shortcut/expansion pairs. ✓ available in English, French, Russian, Spanish, Italian, German, Swedish and Japanese. Please help us add your language. The first and most popular multiple clipboard utility to display, archive and edit clipboards is built into Essential. See and edit any clip in your history of copies or in the more permanent clip archives. Save multiple clipboards through restarts. It is not exactly the same as CopyPaste. In many ways it is better. Incredibly useful, timesaver, lifesaver for all Mac users. ✓ keep a running history of everything you copy. ✓ paste by the number in the history or use the Clip List a window that pops up on a key command or when it reaches the edge (customizable) of a window. ✓ access all clips from the menubar. Use the Manager to add, remove or rearrange clips in the History. Simply a centrally located handy place in the menubar to be able to create, edit and archive your notes. This is Apple’s Reminders app but made handy by being made available instantly from the clipboard. 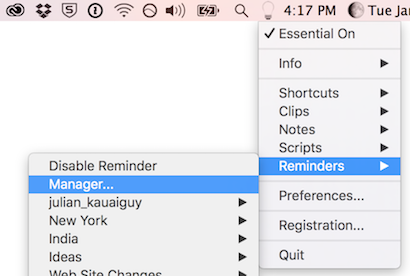 All info is available in any app on any Mac or iOS device within the Reminders app. This allows simply scripts to make handy utilities for counting chars on the clipboard, reformatting text and many other time consuming tasks that can be taken care of in an instant with the tap of a button. One menubar app that provides the usefulness of 5 apps instantly at your fingertips. 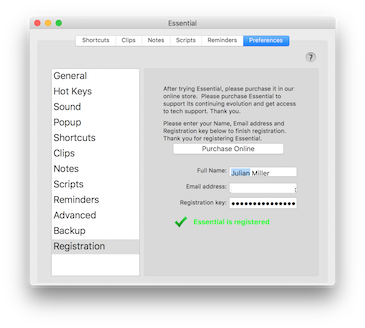 Essential requires Mac OS 10.9 – 10.14 or higher. - in clip manager control click on a clip to get a drop down menu that selecting delete or new (for a new empty clip). 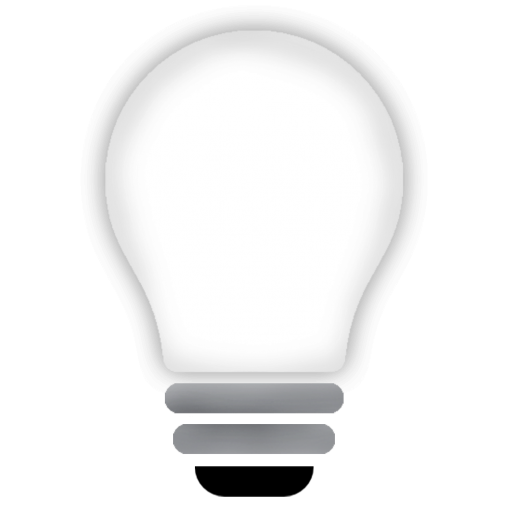 - now hold down the option key when pasting from anywhere in the app to paste text without any formatting. - 2 ways to delete a clip. 2. in the clip history hold down control key and select a clip to delete it. - prefs not saved in new account fixed. - added emoji palette access from main menu. allows display and selection of emoji for entering into documents. please keep the feedback coming. we want essential to be the most efficient machine for getting things done. do less and accomplish more. - put char count at the bottom clips in the manager. - changed terminology in app. shortcut is a combination of trigger, expansion and trigger name. to make it clearer. - no longer possible to have 2 shortcuts with the same trigger. - improved ui for dark mode. - now backup shortcuts, clips, notes, scripts, etc to icloud, dropbox, google drive or local folder. - by default starts displaying only shortcuts and clips. other features can be turned on in preferences. - essential can now be set in preferences to backup daily, weekly or monthly to local folder, icloud, google drive or dropbox. - 'check for updates' (sparkle) now works. you may need to manually update to this version but after this it can check and install semi automatically. you set interval daily, weekly or monthly to check for updates. - count chars in clipboard is in the menu in red. open to comments on this. we will now be focusing on essential. now is the time to let us know your suggestions and bugs you find. - fixed the issue when selecting the registration menu then it did not load the registration page. - fixed string of numbers loading too fast. 4/5/19 Essential is a work in progress. It is solid and we use it but it is new and we know what it can and can’t do. If you are new to Essential we recommend that you start simple just learn about the text expansion and the multi-clip tools. If you start using Essential please give some feedback. Let us know what you like in it, what is is missing and what is broken. The manual needs updating and your feedback and questions will help prompt us to fill in the gaps in the manual. There is a lot undocumented. If you bump into something you don’t understand please ask. Essential is a multifaceted productivity tool that runs in the background to amplify productivity on the Mac. Essential is the successor to yType. yType was just a text expansion tool. Essential in a centralized utility that gives you multiple clipboards, text expansion, notes, reminders, popups like in iOS, scripting and more, all in one app. Essential requires 10.7 or higher. Shortcut – the abbreviation that expands into a block of text or an image. Expansion – this is the block of text the shortcut expands into. An expansion can be plain text or formatted text and optional pictures. Shortcut/Expansion Pair – this is the ‘shortcut’ and the ‘expansion’ items together. The shortcut is replaced by the expansion when typing. Sometimes we just call this pair a Shortcut. Variable – a symbol you can place in the Expansion field that when called can expand into the current date, time, etc. There are many types of variables. Shortcut Variable – a Shortcut can be made into a variable when surrounded by a few extra characters. They can be inserted into other expansions when selected from the Shortcut Variable drop down menu. Clip – is an object copied to the clipboard using the copy or cut menu items or hotkeys. Clipboard – is the container for one clip. 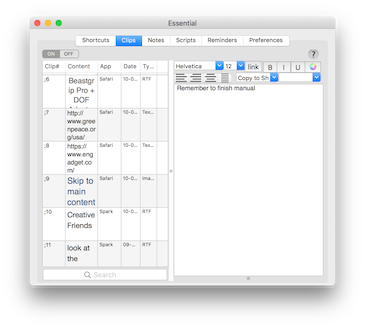 Mac OS X provides one system Clipboard. Clip History – is the shifting stack or chronology of clips copied/cut over time. About – version number and other info. Online Manual – this manual. Suggestions and Bug-Reports… – send feedback. Purchase… – find out more about buying the app. Double click the Essential icon and it will launch the app and you will see Essential’s lightbulb small icon on the right in the top menubar. If you are updating from yType there is info in the FAQ about importing old info. IMPORTANT: The first time Essential starts up it needs your permission to access to certain services. Very important to do for Mac OS 10.13 and 10.14 (Mojave). 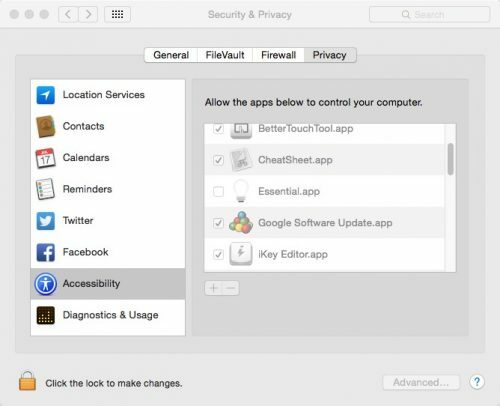 At lower left click on the lock icon and sign in with your user name and password for that Mac. Now click on the light bulb icon on the right site of the top menu and you will see this drop down menu. Essential is now ready to increase your productivity. A shortcut in Essential allows you to type an abbreviation or a larger block of text, image or image & text. Simply, enter an abbreviation (shortcut) and then a block of text and/or picture/formatted text (expansion). Now typing that abbreviation, what we call a shortcut and a space or return will insert that text which we call an expansion. Type a few characters (shortcut) to paste a much larger block of text (expansion) like your name, a url, picture or even several pages of formatted text instantly anywhere on your Mac in any application. create a shortcut (a few letters) to enter large blocks of text or pictures and formatted text in any mac application. copy and paste or drag in the blocks of text, pictures or formatted text. use variables to insert the month, day, year, time, cursor, timezone. embed one variable within another. search thru all shortcut/expansion pairs. available in English, French, Russian, Spanish, Italian, German, Swedish and Japanese. Please help us add your language. 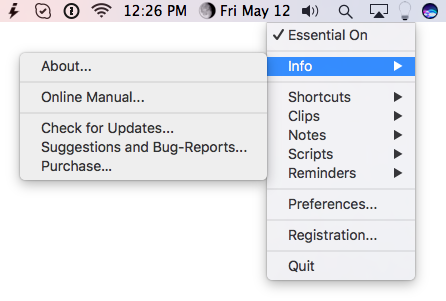 Turn on or off Shortcuts via the preferences or thru the menubar. Put that text in the ‘Expansion’ field at bottom right. Now when you type mya and a space or return then that address will instantly pop into the document. Create a new shortcut by hitting the + button. Type in a shortcut like ;whale Now drag a picture into the expansion box. Now every time you type ;whale you will insert that picture. TIP: You can type in a URL (https://plumamazing.com) in as either plain text or into formatted text. In the formatted text control click on the URL to edit it. If you make a shortcut a regular word in your language then you can’t type that word without getting the expansion. To avoid this we make shortcuts that are not words. In some examples we start the shortcut with a semicolon because it is an easy way to type fast. It also lets us put a memorable name to it. But using any character is fine. Tips to develop your own naming system for shortcuts. Making shortcuts a combination of a rarely used character combined with a descriptive name helps in recalling them. Using a rarely used char in front of the descriptive name allows you to create easy to remember groups. Like ; could precede the first letter of a url like p so that ;p could expand to https://plumamazing.com and be easily remembered. I use the ones below and they save me enormous amounts of time and typing. Experiment and be consistent, over time you will develop your own pattern. Using the ; for all the url’s of your websites can be a handy mnemonic but you can use anything. Using the letter q and a recognizable name could be a good technique for often used long messages, they can even be pages long. Then you can type the few letters of shortcut and have that expand into quickly into a long email. That site tells you what words end with those letters. In this case most are acronyms you will never use. So, it makes a good triggger. You don’t want to use a few letters that you’ll type every once in awhile and be surprised by an expansion. Start Essential at Login – saves time when you restart your computer. Add Space After Expansion – does exactly that. Show Icon in Dock – if checked shows the app in the doc. Below is the variable drop down menu. type the time, date, etc instantly without having to look it up. Use %Y %m %d for year month and date by choosing those variables. Put them in any order you want. Click on cursor variable to put in this %| which after expanding all triggers and variables will set the cursor to be right there where you put the variable. Choosing them from that menu is the best way but its simple to create them yourself. Surrounding Shortcuts with a few certain characters makes them variables. They look like this %shortcut:yourshortcutname%. They all start with %shortcut: then your shortcuts name then a % at the end. We call these Shortcut Variables. %shortcut:nd% will expand into name, date and time. Q: Can I import shortcuts from the old yType app? A: That is no longer possible. Over the long evolution Essential totally changed yType’s format. 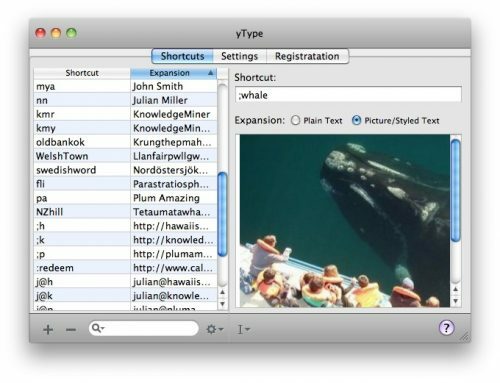 user/library/preferences/ com.plumamazing.ytype.Dictionary.plist in your favorite text editor. Have Essential app open in the shortcut manager. then create folders for your old shortcut and then create your new shortcut. 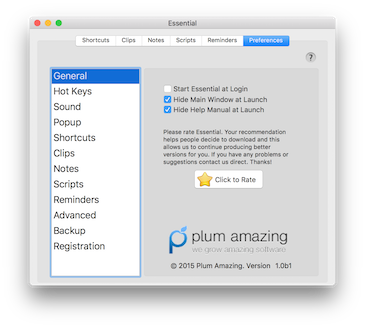 Copy & paste the main content (in this case ‘Plum Amazing’ seen above) from that file to the new Essential shortcut. Then give each shortcut a trigger (that is the new name for shortcut in Essential) and a title/description (optional). Q: How long can expansions be? A: There is no limit. Q: How short can shortcuts be? Q: Can I delete your shortcut examples? Q: Do I have to buy Essential? A: After 30 days we remind you to purchase the software. You don’t have to but we hope you find it useful enough that you want to. Your payment is small but it helps us pay for programming, website, sales, tech support, design and the continuing evolution of the app. We have lots of ideas to make Essential even more essential in the future and the price will go up over time. Q: I use a % in an expansion but it disappears when triggered. One of the revolutionary features that came with the Mac in 1984 was the unique ability to select text or pictures, etc., then copy that data into a clipboard, in order to hold that content temporarily, and then paste it in the same application or in a different one. The clipboard was used to transfer all kinds of info between programs on the Mac. Later, this feature was adopted into other operating systems. 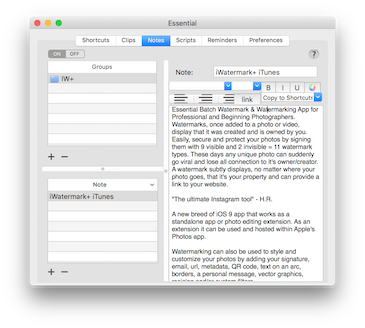 Our app CopyPaste was the first app for the Mac to add multiple clipboards. Essential has this feature as one of it’s abilities called Clips. 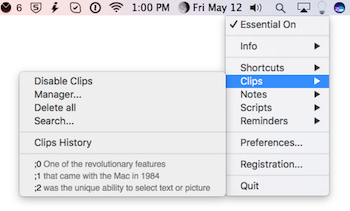 Clips in Essential uses the Mac Clipboard and operates in a similar way but it adds search, editing, usage and display of multiple (infinite depending on RAM memory) clipboards. Disable Clips: enable or Disable clips by selecting this item. Manager: open or close the Clips Manger window. Delete all: deletes all clips in the history. Search: search for a word or phrase in all clips. Clips History: is the title of what comes below. ;0 – this is the Macs main clipboard. Hit cmd v or ;0 to paste the clips contents. ;1 – this is clip 1. Type ;1 to get the contents of this clipboard. Very handy. Notes is a simple note taking app and a place to keep important notes. The Manager for Notes looks like this screenshot to the left. There you can create, view, edit and archive notes. General – options for launch of the app. Hot Keys – display and edit all the key commands for major parts of the app. Open Essential – click the button to set the hotkey to open Essential. Selection to Expansion – highlight any text hit this key combination and Essential will open with that text in the Expansion area. All you have to do is type a shortcut. TIP: To set the hotkey button hold down any of these command ( ), option ( ), shift ( ), control ( ) and any regular key (a, b, c…1, 2, ‘,…) to change/set that hotkey. Sound – change the sound settings for the app. Popup – like in iOS when on this allows selecting an item shows a popup with options like copy, paste, spelling, definition. Shortcuts – these are the settings for the shortcut tool. Clips – set the number of clips in history and other options for clips. Notes – no settings yet. Scripts – no settings yet. 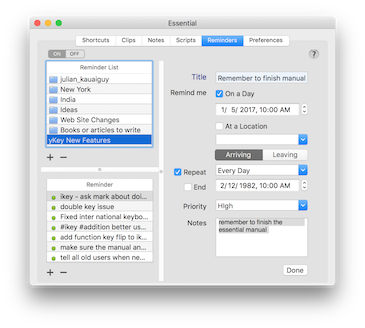 Reminder – set reminder length and reminders displayed. Backup – backup locally or to the cloud from here. Registration – when you are ready to buy the app and purchase you will receive a registration key to copy and paste to here. Q: Where are Essential files located including the preferences? A: Essential is an application and should be in the application folder. The files contains all the data for Essential. Make sure to use the Back Up feature to back up data locally and to the cloud occasionally. If you have questions please make sure to read the manual and faq first then feel free to contact us. We especially enjoy hearing your suggestions. Also if you would like to see the application or this manual in your language so more people in your country can use Essential then please contact us. There is a short list of english text that you translate which we then pop into the app to localize it for your language. Once you purchase you will receive a registration code that you can enter into the app in the Registration preference area. Remember to copy and paste your name and email address and hit the apply button.